27 Dec 2016 Space, time, and the startup > Uniphore and Ather Energy featured - "From enabling rural populace and a mission to the moon to generating content and building a durable commute choice, four Indian ventures have made a mark globally this year. The Hindu MetroPlus narrates their success stories"
Muconnect: This gadget will ensure that your phone is always charged > ConsumeX Industries featured in the Top 50 hot startups for 2017 in Economic Times. 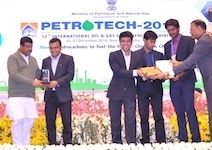 Planys Technologies received “Startup in Hydrocarbon Sector – Rising Star” award at Petrotech 2016, the premier International Oil & Gas Sector Conference and Exhibition under the aegis of the Ministry of Petroleum and Natural Gas, Government of India. 16 Nov 2016 Two incubated startups makes it to the Deloitte Tech Fast50 2016 List (India's fastest growing tech companies): Stellapps Technologies (#2 position) and Nadhi Information Technologies (#36) > A proud moment for IITMIC and RTBI! 28 Oct 2016 Ather Energy raises $30.5 million (Rs. 205 crore) from Hero MotoCorp > Ather has received Rs 180 cr of the total investment with the rest due to be released in tranches. The deal values the 3yr old company at Rs 680 - 790 crore. Hero buys 30% stake in Ather. 16 Oct 2016 #IITMadras' Rural Technology & Business Incubator (RTBI) completes 10 years! A decade of solving rural problems with technology > From tinkering with ideas in a small lab within IITM 10 yrs ago to brainstorming in a spacious office in the IITM Research Park today, the RTBI has shaped the course of 45 companies till date. Of these, 17 companies have graduated, 18 have raised angel/venture funds to the tune of over 100 crore and 28 are revenue-making. Firms incubated here work in varied areas, including energy efficiency, water & wastewater management, education & skill development, agri-space innovations and speech recognition solutions. 16 Sept 2016 Kamal Kisan wins the Syngenta 'Best Agricultural Enterprise' at the DBS - NUS Social Venture Challenge Asia in Singapore > IIT Madras (RTBI) incubated company Kamal Kisan received an award of S$10,000 for being the best agriculture social enterprise. Company develops tools to help farmers reduce labour-intensive tasks and increase profitability. One of their tools is the sugarcane planter that improves efficiency by 80%. Award 2016 is the banner year for IIT Madras it seems, when we claim the leadership spot ! Ather Energy wins "The Economic Times Startup Awards 2016" under 'Best on Campus' category > Congratulations to the finalists and a proud moment for IITM Incubation! How the jury selected winners for the ET Startup Awards 2016 > The Best on Campus category — where startups founded in colleges are recognised — came in for attention and praise. ‪#‎IITMadras‬ was especially singled out because four out the five in the shortlist were born on the Chennai campus. The eventual winner, Ather Energy, was one of them. Hosanagar actually wanted IIT-Madras to be awarded a prize. Times Internet Vice-Chairman Satyan Gajwani described the Best on Campus category as "pretty amazing" for throwing up interesting surprises. 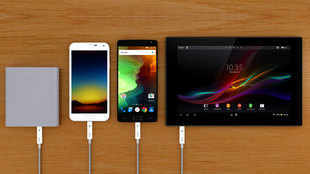 "It is very interesting to see the kind of innovations coming out from these college campuses. It wasn't the usual 'Let's build an ecommerce company'. It's disruptive and different," he said. Planys Technologies, Detect Technologies , HyperVerge and Ather Energy. An inspiring and proud moment for all! The companies are founded by IITM students & graduates (some jointly with their faculty mentors), and are working primarily in the manufacturing sector. Winners to be decided on Saturday, 6th Aug.